The Governance of VCOR is in keeping with the operating principles established by the Australian Commission for Safety and Quality in Healthcare. 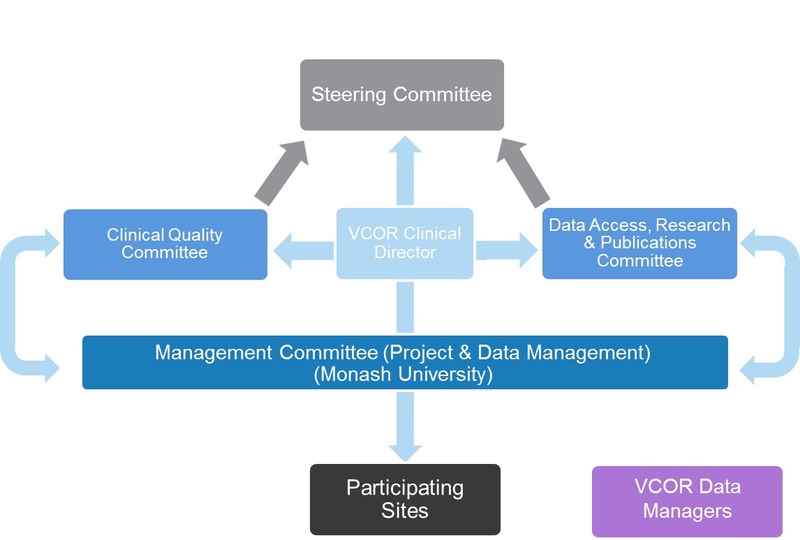 All project matters are governed by the VCOR Steering Committee (SC) by way of liaison with the two VCOR subcommittees: The Clinical Quality Committee (CQC) and the Data Access, Research and Publications Committee (DRP). All committees are made up of a selection of relevant VCOR stakeholders (e.g. clinicians, statisticians, epidemiologists, nurses, consumers etc). VCOR Steering Committee and sub-committee members are appointed based upon their relevant expertise, and will provide guidance on key issues and policies. Day to day registry operations are managed centrally by staff within the Centre for Cardiovascular Research and Education in Therapeutics, Department of Epidemiology and Preventive Medicine, Monash University. The Registry Custodian is Professor Christopher Reid, Centre for Cardiovascular Research and Education in Therapeutics, Department of Epidemiology and Preventive Medicine, Monash University. As each new module is developed, a management committee is convened, comprising of stakeholders with specialised expertise in the cardiovascular health area relevant to that data collection module. VCOR currently has two additional management committees for the Management of Acute STEMI in Regional Victoria and the Heart Failure Snapshop data collection modules. All relevant matters for consideration are reported up through the Steering, CQC and DRP committees.